Kitty Rambles A Lot: Father's Day! This is what I got for my Dad. 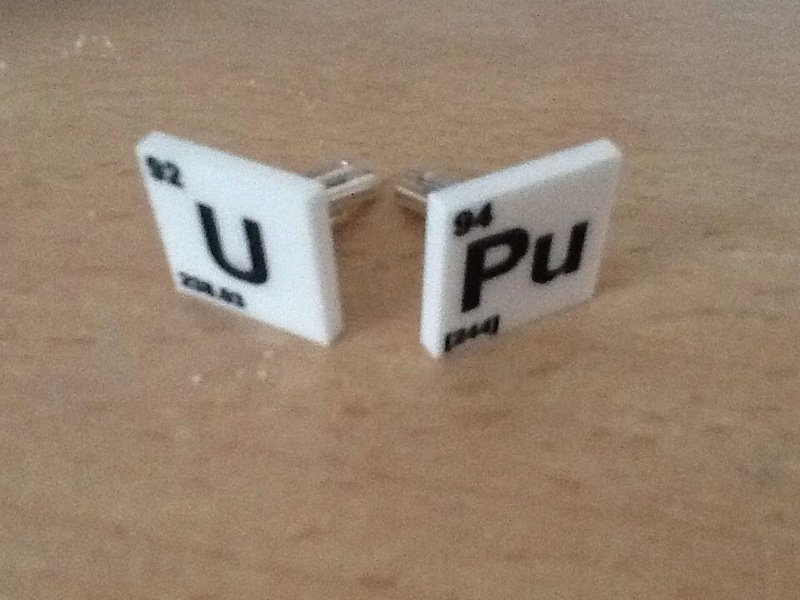 Custom Uranium and Plutonium element cufflinks from Sugar & Vice. He works in the power industry so he enjoyed these! My outfit :) Stu took the first one but I think the hemline is more visible in the second one. Isn't it cute? The dress is from New Look, my Mum found it in store on sale and treated me to it :) thanks Mum! I wouldn't normally go for a pink dress, but I liked the lace detailing and the hem is so cute. I usually live in plain black leggings but I'm trying to break that habit, so cute new leggings! These are from ASOS. The material they are made of is so soft, I love them and will be keeping an eye out for more. My sandals are from Evans last year, it is so hard to get a size 10! The are wedge heels which I find much more comfortable. To finish the outfit off I wore one of my favourite necklaces, the Sugar & Vice Swimming Mermaid necklace £20, and my black Gorilla Glass super spirals.